Bird Report 042911: 5 Baby Ravens! I checked DeKorte around 12:30pm, picked up a first of year Caspian Tern flying over the Kingsland Impoundment. 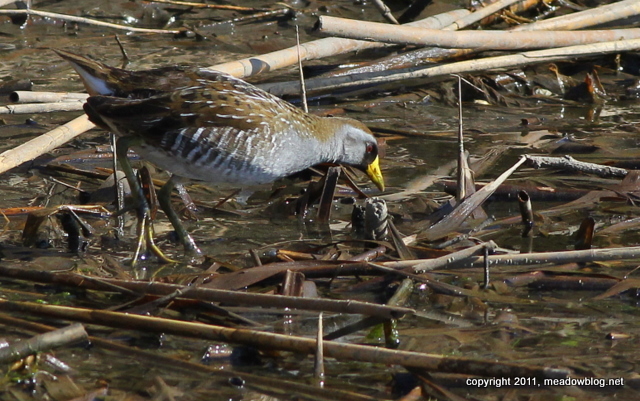 No sign of the red-necked phalarope, but the Common Moorhen, American Coot and Sora continued. 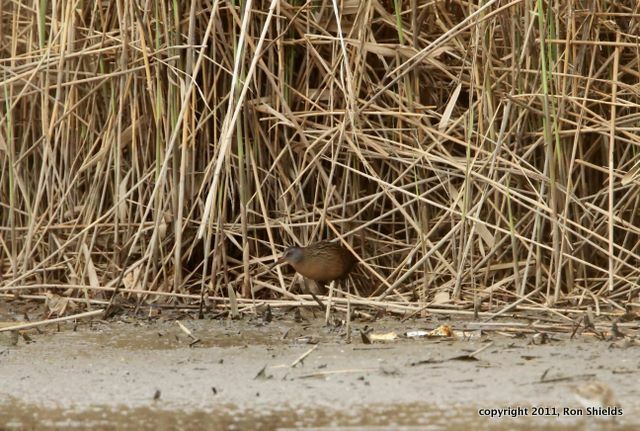 I also had a brief look at a Virginia Rail in the phragmites. Around 4pm, I visited Schmidt's Woods where I got my first of year female Scarlet Tanager. For warblers had Northern Parula, Yellow-rumped, Black-throated Green, Black-and-white and Ovenbird. I closed out the day at Laurel Hill Park. I had my scope and checked the nest. I can confirm at least 5 juvenile Common Ravens on the nest so far. Vincent Nichnadowicz reports: "I had a lucky, close view of a Swallow-tailed Kite at 3:52 p.m., 29 April, from the parking lot round-about near the Visitor's Center looking up the incline towards what I presume is Disposal Road (area where the Northern Shrike was two winters ago). 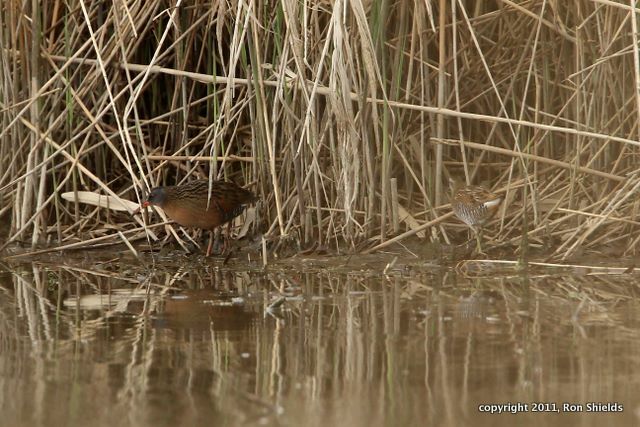 I mentioned to Ron Shields yesterday that I had heard two reports of a Virginia Rail in the Shorebird Pool at DeKorte earlier in the day. I said it was too bad the bird was too elusive for a photograph. Ron managed to go out on the Marsh Discovery Trail and get a distant photo of the rail above, and a distant shot of the rail with a Sora as well, below. "Pic was taken from the Marsh Discovery Trail just beyond the Canada Goose nest or the first blind on the left. I was looking back towards the parking lot from the "bridge" when Chris Takacs' friend pointed out the sora. "Vincent Nichnadowicz observed a Swallow-tailed Kite over the DeKorte Park Visitors Center (Lyndhurst, NJ) at 3:52 today (Friday 4/29)." Several of us went combing the skies, to no avail. If anyone took a photo of the kite, please let us know here. We are getting reports of ticks from all over, so take care — might wear long pants and long sleeve shirts, and tuck your pantlegs into your socks. Also, please stay on trails. The tick photographed here is a Wood Tick that hitchhiked a ride with an NJMC naturalist this week. 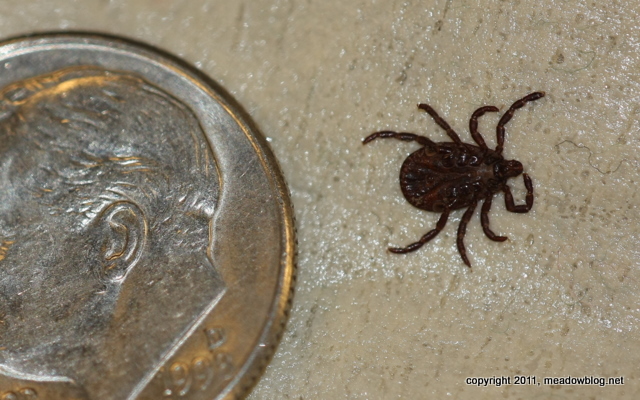 Deer tick are even smaller and can carry Lyme Disease. 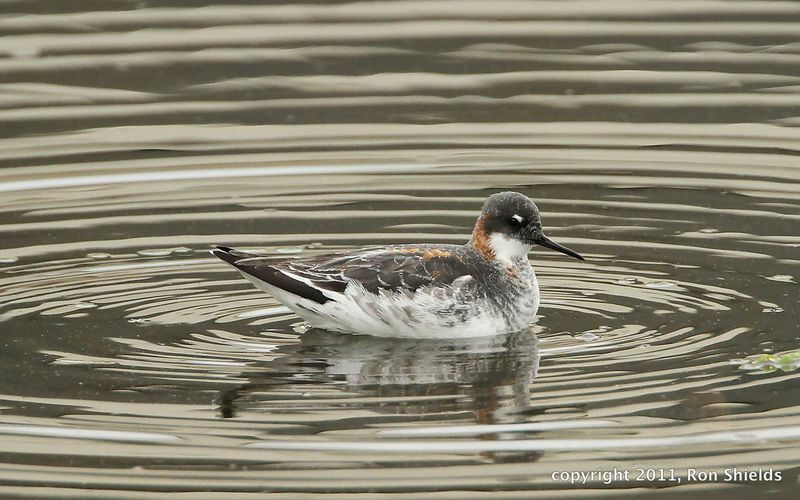 "The Red-necked Phalarope has not been seen as of 8:30 this morning. However, there are some interesting birds around DeKorte Park." 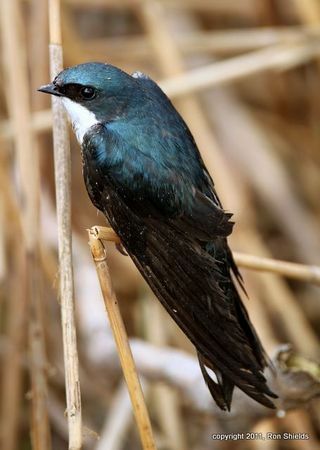 Included are images of a pair of Tree Swallows whose antics caused them to crash land on an exposed mudflat a few feet off the Transco Trail Tuesday afternoon. The pair had been engaged in their usual aerial acrobatics when they suddenly hit the mud and became completely stuck. 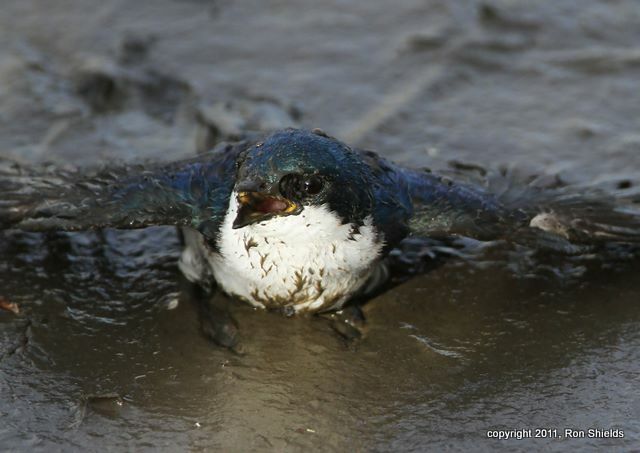 They couldn't move…or fly as their undercarraige was soaked in mud. Not having a tree limb at my disposal, I turned to my trusty camera monopod and helped them out a bit. One perched in the phragmites quite shaken from the ordeal while the other "walked" to cover. Here's hoping that they were both OK. Man…the things you see in the Meadowlands! 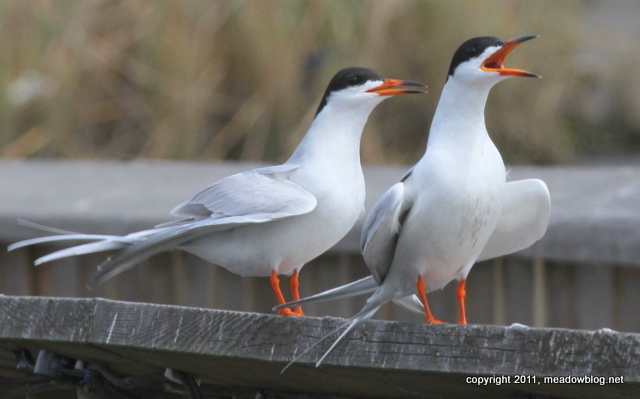 Now a great time to see Forsters Terns at DeKorte. They often perch on the railings on the elevated boardwalk outside the Meadowlands Environment Center. Mike Gempp spotted this Red-necked Phalarope this afternoon between 4 and 4:30 in the Shorebird Pool near the transect of the Transco Trail. Let's hope it hangs around. 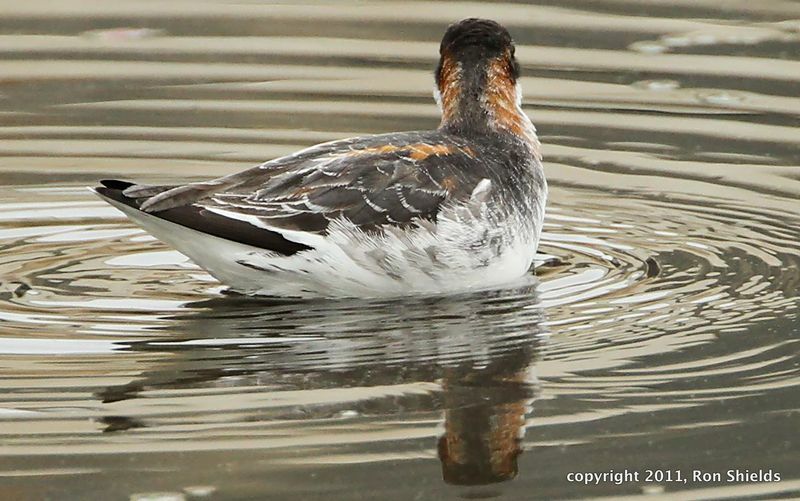 More on Red-necked Phalaropes here. 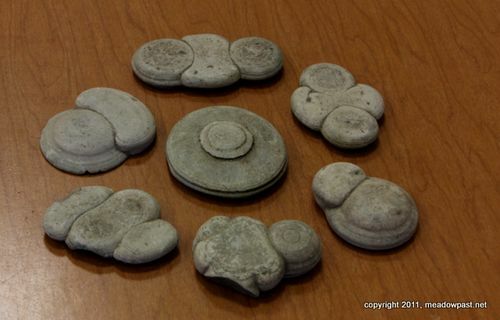 Our sister blog, meadowblog.net, has a neat post about these mysterious objects. They were found in a display case in the Little Ferry Public Library.